Microsoft Lync Connectivity Analyzer helps Lync administrators determine whether the deployment and configuration of their Office 365 or on-premises Lync Server environment meets the requirements to support connections from Lync Windows Store app and Lync apps on mobile devices. Lync Connectivity Analyzer attempts to connect to Lync Server on-premises or Lync Online by using the same services and protocols that are used by Lync Windows Store app and Lync mobile apps. You can perform the connection tests over your internal network or over an external network that connects to Lync Server or Lync Online. Lync Connectivity Analyzer provides a report with detailed information about each connection step to help you validate your configuration and troubleshoot connection problems. You can download Lync Connectivity Analyzer from the Microsoft Download Center at http://go.microsoft.com/fwlink/?LinkId=277056. In Lync Account Type, select Office 365 or On-Premises. In SIP URI, enter the SIP sign-in address for the Lync connection in the format user@domain.com. In Password, enter the password associated with this account. In User name (optional), enter a user name if applicable. The user name is also known as the User Principal Name (UPN). If the user name and the SIP URI are the same, you do not need to enter a user name. If they are not the same, enter the user name in the format user@domain.com or domain\user, as appropriate. Network access, choose From inside my organization if you are running Lync Connectivity Analyzer from a computer connected to your internal network. Otherwise, choose External (Internet). Lync Connectivity Analyzer always performs both internal and external tests, but specifying whether you are inside or outside of your own network helps the tool interpret whether certain failures are expected. In Client, select whether to perform connectivity tests for the Lync Windows Store App, Lync Mobile 2010 App, or Lync Mobile 2013 App. If you want the tool to discover the Lync server automatically, select Automatic. If you want the tool to bypass the autodiscover test, or if you know the name of the server you would like to connect to, select Manual using address: and specify the fully qualified domain name (FQDN) of the Lync server—for example, lync.company.com. (Optional) Under Log File, select the checkbox if you would like to create a log file at the specified path. If logging is enabled, click Clear to clear the log file, click Open to open and view the log file, click Email to open an email message to send the results to your support team (you must manually attach the log file from the path specified). The following figure shows sample results from Lync Connectivity Analyzer. Lync Connectivity Analyzer attempts to discover the Lync server and establish a connection by using the same steps used by Lync Windows Store app and Lync mobile apps. It performs the tests as described in this section. Queries Domain Name Service (DNS) for autodiscover URLs. Attempts discovery by using the secured internal channel. For example, HTTPS://lyncdiscoverinternal.company.com/. Attempts discovery by using the unsecured internal channel. For example, HTTP://lyncdiscoverinternal.company.com/. Attempts discovery by using the secured external channel. For example, HTTPS://lyncdiscover.company.com. Attempts discovery by using the unsecured external channel. For example, HTTP://lyncdiscover.company.com. Queries DNS for the server’s FQDN. Attempts discovery by using the secured channel. For example, HTTPS://serverFQDN/. Attempts discovery by using the unsecured channel. For example, HTTP://serverFQDN/. Verifies that the WebTicket service is available and tests authentication of the Lync account credentials. Verifies that the Authentication Broker (Reach) service is available. Verifies that the Mobility (MCX) service is available. Verifies that the Mobility (UCWA) service is available. While performing these tests, Lync Connectivity Analyzer validates the certificates installed on Lync Server, hardware load balancers, proxy servers, and the computer on which you are running the tests. Remote Connectivity Analyzer can test connectivity for Microsoft Exchange and Outlook, in addition to Microsoft Lync. Remote Connectivity Analyzer completes the SIP sign-in, whereas Lync Connectivity Analyzer only validates the account credentials, without signing in. Remote Connectivity Analyzer tests connections only from outside of your organization’s network because it runs from a public web server. Remote Connectivity Analyzer does not test the availability of Authentication Broker (Reach), Mobility (MCX), and WebTicket services. 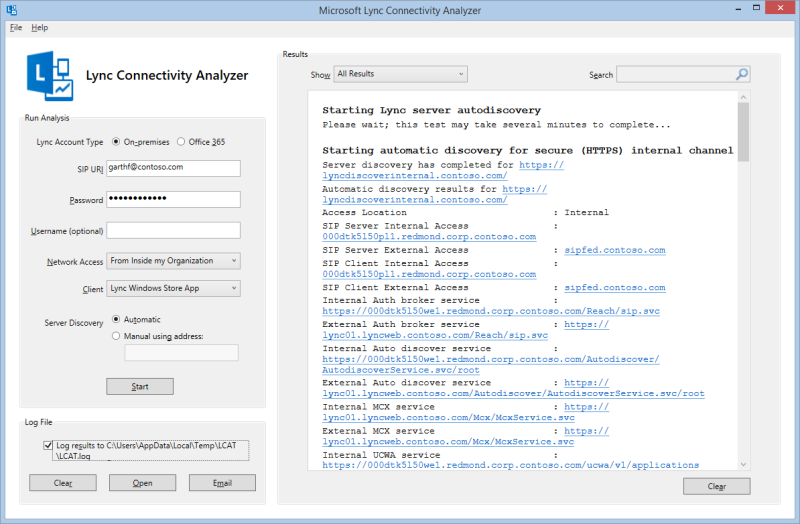 Lync Connectivity Analyzer tests the Autodiscover service. Remote Connectivity Analyzer can connect to any version of Lync Server, whereas Lync Connectivity Analyzer can connect successfully only to Lync Server 2010 with Cumulative Updates for Lync Server 2010: February 2012 (at a minimum), or the latest version of Lync Server.